Jay Wright (left) with Baker Dunleavy, a former assistant who’s now the head coach at Quinnipiac. 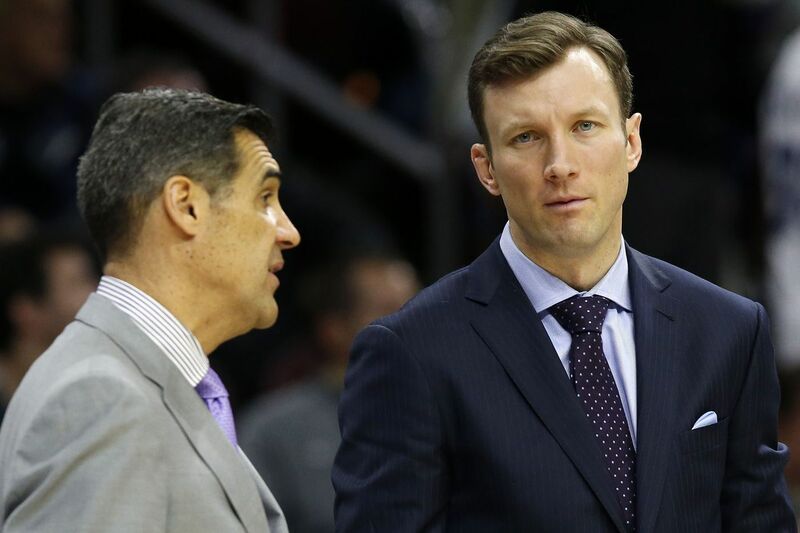 Jay Wright will be happy to see his former assistant, Baker Dunleavy, after Villanova plays Saturday night at the Wells Fargo Center. Before that, however, Wright has to coach against Dunleavy when the ninth-ranked Wildcats take on Quinnipiac (8 p.m., Fox Sports 2 and WTEL 610-AM). "I hate it," Wright said. "I don't enjoy coaching against friends and I certainly don't enjoy coaching against former assistants. I can't remember why we did this. I think they wanted to come back so, of course, we wanted to have Baker back with his team. I wish there was another way we could have him back without playing against him." This will be the seventh time Wright has gone up against one of his former assistants. He has played three games against Joe Jones, two at Columbia, one at Boston University; two against Billy Lange, both at Navy, and one against Patrick Chambers at BU. The Wildcats have won all six. Dunleavy, who played at Villanova from 2003 through 2006, was a member of Wright's staff for seven seasons, the last four as the top assistant. He accepted the job at Quinnipiac in March 2017, shortly after the Wildcats were eliminated from the NCAA tournament. "Making this game happen was really cool for me," he said. "Just the idea of going back to a place I've called home is an honor. Within the 40 minutes, we'll all compete, it will be another game. But the buildup to it, honestly, is a little uncomfortable because everybody asks so much about me when it's so much more about the players." The Bobcats finished 12-21 last season. They won two games in the Metro Atlantic Athletic Conference tournament before losing in the semifinals to Fairfield. Dunleavy has six new players on his roster, four freshmen and two transfers who sat out last season. Dunleavy said he "learned a ton" in his first season as a head coach, and used some of the guidance Wright provided him during his time at 'Nova. "The biggest piece of advice he probably gave me," he said, "was 'Hey, you've been at Villanova for a long time. Obviously you're going to do a lot of the things that we do because it's a part of you. But make sure everything you do, you're yourself. You've got to be comfortable in your own skin and do it your way.'" Wright said he likes the way Quinnipiac runs its offense, and that Dunleavy has "a creative, intelligent offensive mind. "He was great for us, great for me that way," he said. "They run a lot of different pick-and-roll actions that are very difficult to defend, and they disguise them really well, too. He's a lot better offensively than me." This will be the Bobcats' first game of the season. Villanova won its opener, 100-77, Tuesday night over Morgan State. Dunleavy, who said he expects about 30 family members and friends at the game, said he and Wright text each other every few days but that there hasn't been any communication since Monday. "Once we're on the road, it's a business trip," he said. "It's just kind of getting to our own surroundings, create our own environment, and be into us. Then after the game, we'll all get together."